Jared Unzipped: Brew Spew 2015 Part 1: Anderson Valley Fall Hornin' Pumpkin Ale. 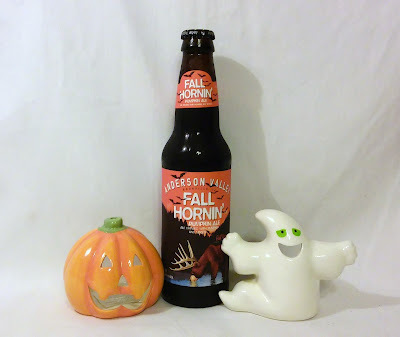 Brew Spew 2015 Part 1: Anderson Valley Fall Hornin' Pumpkin Ale. Whilst beer shopping at my local Total Wine retail establishment in Greensboro, North Carolina, my better half Crystal had one hell of an idea. I should write an article every Friday night for the month of October featuring a seasonal beer. Completely floored at her keen insight, I immediately agreed. Throughout the month of October, I will review one seasonal beer every Friday. That's five tasty reports in an effort to bring you, the committed reader, the best in top notch seasonal beer information. My critiques will be fair and honest. If I like a beer, I'll tell you why. If I dislike a beer, I'll also tell you why. No matter what, you'll get the truth. In reality, this was also a fantastic excuse for me to drink guilt free and then get to write about it... but I digress. The inaugural beer of what I'm calling JARED UNZIPPED'S 2015 BREW SPEW is the Fall Hornin' Pumpkin Ale from Anderson Valley Brewing Company. Based in Boonville, California, Anderson Valley Brewing has been in operation since December 26, 1987. At the time, they were one of only twenty known craft breweries in the United States. They've expanded from a meager ten barrel brew house to a state of the art three-story Bavarian style brewery. Over the years, they've been awarded time and time again for various beers, ranging from their Boont Amber Ale to their Winter Solstice Seasonal Ale. Fall Hornin' Pumpkin Ale is available every year between August and October. It is 6% Alc. by volume and available nationwide through most major specialty adult beverage retailers. So, how did it taste? Well, I'll break my analysis up into two different stages. Keep in mind that I'm writing this article as I drink the beer, so the points I make will be in real time. The fragrance is somewhat strong and spicy, but not overpowering. It is dark chestnut colored. The immediate taste is not bitter. This ale tastes like a dark stout beer, but not as bold in flavor. I could smell the spices more than I could taste them. Not necessarily a unique seasonal taste, but very smooth and easy to drink -- perfect for all year round. The various seasonal spices, especially the nutmeg, are much more apparent. The fragrance has also improved and become more assertive, much to my enjoyment. No funky aftertaste like some other stouts. All in all, this was a fantastic seasonal ale that only improved after letting it come to room temperature. Fall Hornin' Pumpkin Ale is a beer that doesn't need to be refrigerated to taste great. It has just the right amount of spice to let you know it's Fall, but not so much that you get tired of the taste. This is pleasant and quite effortless to drink, honestly. 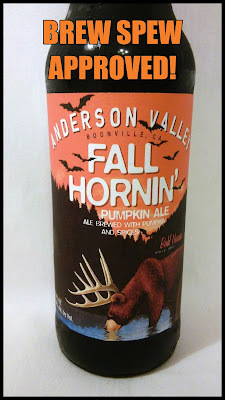 I highly suggest you give Anderson Valley's Fall Hornin' Pumpkin Ale a try!